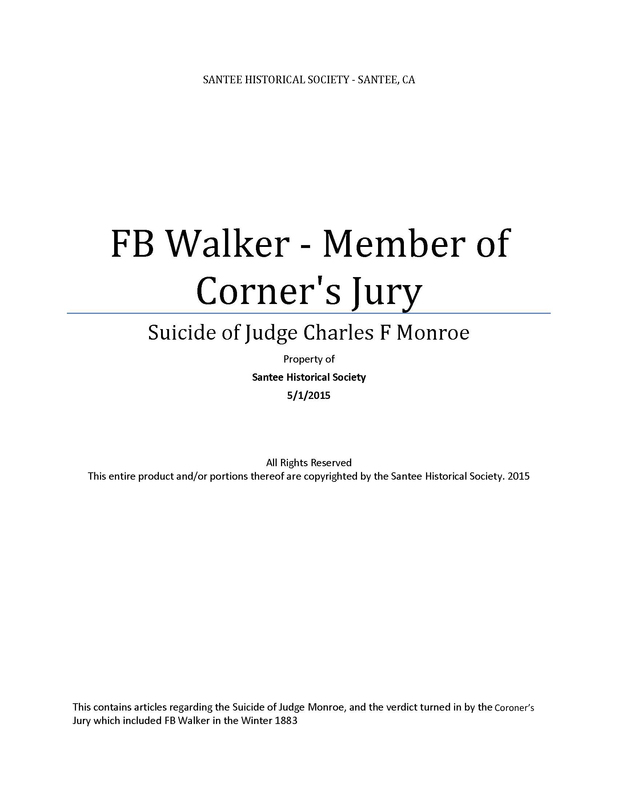 Suicide of Judge Monroe & the decision of the Coroners Jury which included FB Walker, a prominent Santee Pioneer. RELIEVE PAIN – ACQUIRES HABIT – FAILS TO SECURE RELIEF. alleviate his suffering. Some ten days ago he began the Keeley Bichloride of Gold Treatment and was quite hopeful that he would master the habit. On Saturday and Sunday, however, his mood changed and he was perceptually weak and irritable. He requested a dose of morphine from his wife, which she refused, and though not showing resentment, her husband manifested evidence of pain. On returning, he kissed his wife goodnight and gave her a peculiar glance, which she noted. Somehow he managed to secure the revolver laying under her pillow and she was hardly asleep before the shot was fired. The bullet entered the right temple and passed out of the head behind the left ear. The bullet was found in the bed after the dead man was removed. The revolver is hammerless and is the weapon with which I.E. Alexander killed Craven in 1889. 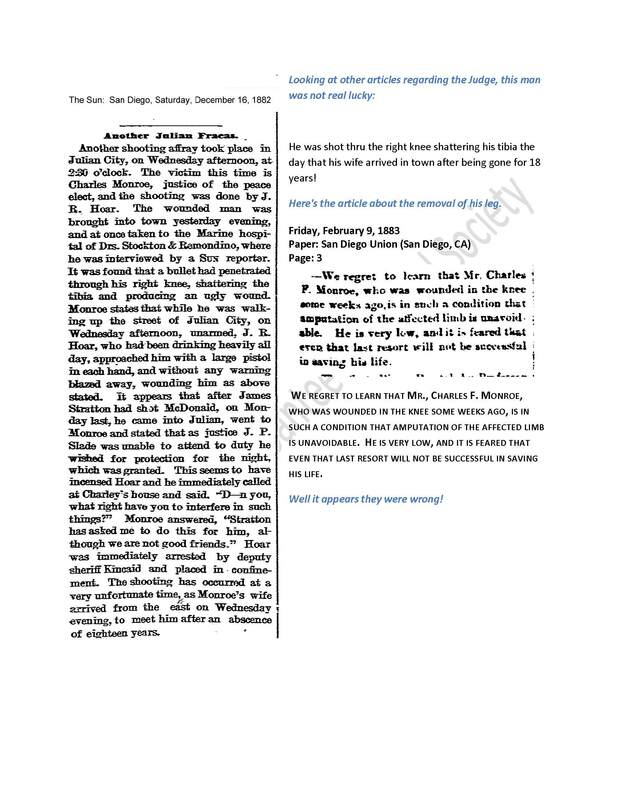 The jury render a verdict of suicide, according to the evidence presented. The funeral will be held this morning at the undertaking rooms, the Rev. H.B. Restarick officiating. Judge Monroe was a native of Salem, Mass, and was 51 years of age. SOME OF MY QUESTIONS ARE: WHY DID THE WIFE HAVE A GUN UNDER HER PILLOW? ALSO, IF SHE WAS SLEEPING NEXT TO HIM WHILE HE SHOT HIMSELF, AND THE BULLET WENT COMPLETELY THRU HIS HEAD, WHY WASN’T SHE KILLED, OR AT LEAST HURT ALSO? Judge Charles F Monroe, justice of the peace to this city, ended his life last night by sending a bullet through his brain at his residence, 1270 Union Street. Deceased and his wife retired about 9 o’clock in the evening. He complained of not feeling well, and told her to try to go to sleep. She turned over on her side and then became quiet. A lamp had been lighted and turned down, so that it shed only a faint light. Suddenly a pistol was discharged, and when Mrs. Monroe sprang up in bed the judge gave two or three gasps and expired. The bullet had entered just above the right ear. Death was almost instantaneous. Judge Monroe’s terrible act is attributed to ill health. Some years ago at Julian he was shot in the leg and amputation was necessary. He had been troubled with the limb ever since and at times the pain was almost unbearable. He was also suffering from asthma. Mrs. Monroe says that he had been complaining for over a week. An inquest was held Monday over the remains of Justice Charles f. Monroe, who sent a bullet through his brain Sunday night, while lying in bed with his wife at his side. The coroner’s jury was composed of SH Olmated, ML Cardell, JA Bailey, FB Walker, WJ Davis, OC Eberhart, MG Bunce, AE Dodson, CE Heath, and CA Bargoyne. From testimony elicited it was learned that Justice Monroe had suffered terrible pain at times from the stump of his leg, and had acquired the morphine habit in his efforts to alleviate his suffering. Some ten days ago he began the Kelley Bichloride of Gold Treatment, and was quite hopeful that he would master the habit. On Saturday and Sunday, however, his mood changed and he was perceptibly week and irritable. He requested a dose of morphine from his wife, which she refused, and tho not showing ay resentment, her husband manifested evidence of pain. The jury render a verdict of suicide, according to the evidence presented. The funeral will be held this morning at the undertaking rooms, the Rev. H.B. Restarick officiating. Judge MMonroe was a native of Salem, Mass, and was 51 years of age.